We have become exposed to an increasing number of chemicals in the food supply, the air that we breathe, and through a lot of common items used daily – including cosmetics and household cleaners. Among all the potential adverse effects, these chemicals, once they build up in your system, can interfere with weight loss. While several factors can contribute to this build up, researchers find that environmental toxins play a crucial role in being overweight or obese. This is where a well-designed body detox plan comes into play. Besides helping you eliminate the wrong foods that can contribute to weight gain, the right program can give your liver and your overall health a helping hand in eliminating those excess toxins. Detoxification starts inside your liver. It’s a complicated process, but your liver essentially does this in two phases. First, it converts toxic substances to highly reactive metabolites and then excretes these toxins. 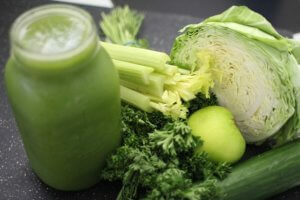 Your kidneys, lungs and even your gut play a crucial role in detoxification. Toxins can impact these same organs both acutely and cumulatively. More dangerous are the persistent. low-grade toxins such as residue you consume regularly in traditionally cultivated fruits and vegetables. The reactions aren’t immediate, and you may not see the connection between chronic low-grade toxicity and weight loss struggles. Here are a few ideas for you to help support liver health and your body’s natural detoxification processes. Numerous studies proved that whole foods, including cruciferous vegetables, berries, garlic and spices such as turmeric can help your body detoxify through different pathways. Paired with protein and quality fat, you can use these to create an optimal food plan that will help you detoxify and shed excess weight. Whenever possible, opt for organic plant foods and the highest-quality animal foods. Toxicity is known to contribute to inflammation, which then leads to a heavier toxic load, thus stalling fat loss. An anti-inflammatory diet includes wild-caught seafood, plant foods rich in omega-3 fatty acids including flaxseed and chia seeds, non-starchy vegetables and spices including turmeric. Among its benefits, exercise can better help your body eliminate toxins and burn more fat effectively. Whether it involves hot yoga or high-intensity interval training, find a consistent workout plan that fits with your personal preference and schedule and stick with it. A couple of years ago, scientists discovered a brain detoxification process called the glymphatic system, which happens when you sleep. According to the experts, insufficient sleep can impair your glymphatic system, thus causing toxin buildup. Without quality sleep in the right amounts and on a consistent basis, your body can’t detoxify effectively. So, there you have it. This is just a glimpse at what the detoxing process looks like and entails. Remember, toxic overload is an often-overlooked factor in obesity, and the right detoxification plan can help provide the nutrients your body requires to help you heal and lose weight. You may also speak with a health care provider to help you draw out a detoxifying strategy.